Melbourne beaches can be found just south of Melbourne city centre. Because the river Yarra runs through it, and major Melbourne attractions lie along its banks or north of it, visitors to Melbourne tend to forget that this is a bayside city with a number of beaches. Coastal Melbourne faces Port Phillip Bay and the city's closest Melbourne beaches are Albert Park and Middle Park just south of South Melbourne. The next Melbourne beaches south would be St Kilda, Elwood, Brighton, and Sandringham. St Kilda Beach is sometimes likened to Sydney's Bondi Beach with the suburb of St Kilda developing in the 19th century as Melbourne's seaside resort. By the start of the1900s, St Kilda had become the home of some of the wealthiest Melburnians. Then it went into decline with brothels and drug dealers making St Kilda their turf until more recent changes gave the area a much-needed facelift with fashionable boutiques, stylish cafes and many fine restaurants. Along the St Kilda foreshore, the pier juts out into the bay and Melbourne's Luna Park, a fun park such as Sydney's Luna Park, lies just south of it. The beach remains one of the more popular Melbourne beaches close to the city centre. 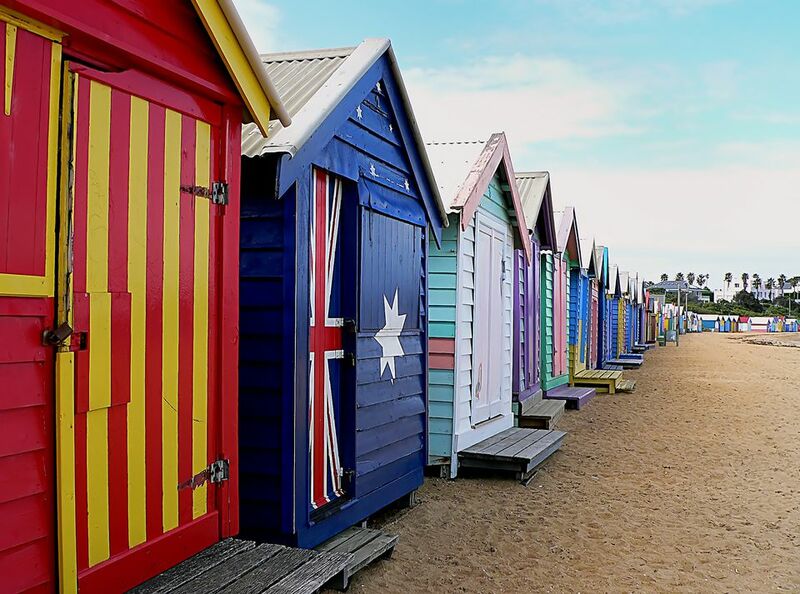 A feature of Brighton Beach, south of St Kilda, is the number of brightly colored bathing boxes a short distance from the water. These bathing boxes used also for the storage of clothes and sometimes small watercrafts, are private change rooms. They are found mainly on Brighton and on the beaches of the Mornington Peninsula. Surfing areas of choice are located outside the greater Melbourne metropolitan area: in the east, in the Mornington Peninsula; and in the west, along with the Great Ocean Road, such as Bells Beach near Torquay where the international Rip Curl Pro surfing competition is held at Eastertime.